Louise Hay is known as one of the founders of the Self Help movement and is the head of Hay House, a successful publishing company. After an unstable and impoverished childhood, she started what would become her life’s work in New York City in 1970. She attended meetings at the Church of Religious Science and began training in the Ministerial Program. She became a popular speaker at the church and soon found herself counseling clients. After several years, Louise compiled a reference guide detailing the mental causes of physical ailments and positive thought patterns for reversing illness and creating health. This compilation was the basis for her best-selling book, Heal Your Body, which was introduced to people in 30 different countries. She began traveling throughout the United States, lecturing and facilitating workshops on loving ourselves and healing our lives. Louise put her philosophies into practice when she was diagnosed with cancer. After developing an intensive program of affirmations, visualization, nutritional cleansing, and psychotherapy, she was completely healed of cancer within six months. In 1985, Louise began her famous support group, “The Hayride,” with six men diagnosed with AIDS. By 1988, the group had grown to a weekly gathering of 800 people. The Hay Foundation and the Louise L. Hay Charitable Fund are two nonprofit organizations that support many diverse organizations. Louise’s healing message has also been the subject of many newspapers and magazine articles. She has appeared on television around the world, and her monthly column, “Dear Louise,” appears in over 50 publications in the United States and abroad. • See God in every person, place, and thing, and all will be well in your world. • Love is the great miracle cure. Loving ourselves works miracles in our lives. • We may not know how to forgive, and we may not want to forgive; but the very fact we say we are willing to forgive begins the healing practice. • Remember, you are the only person who thinks in your mind! You are the power and authority in your world. Louise’s publishing company, Hay House, has been responsible for spreading Self Improvement and Self Help books far and wide. 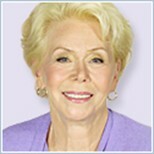 To fully appreciate Louise Hay, you must appreciate what she has accomplished with Hay House. But her personal contribution to the Self Improvement market is best illustrated by her book, You Can Heal Your Life, and this is the place I suggest you start. • Every thought we think is creating our future. • The point of power is always in the present moment. • Resentment, criticism, and guilt are the most damaging patterns. • We must be willing to begin to learn to love ourselves. • When we really love ourselves, everything in our life works. You Can Heal Your Life contains insights, exercises, and information to help you grow. With the new illustrations, the book has an almost spiritual or heavenly feel about it. Toward the end, Louise shares her personal story, and after finishing, all I could think of is that I need to give this woman a hug. Hopefully, one day I’ll be able to.